I love to make string blocks, but I really was going to use Christmas colors for my next one. 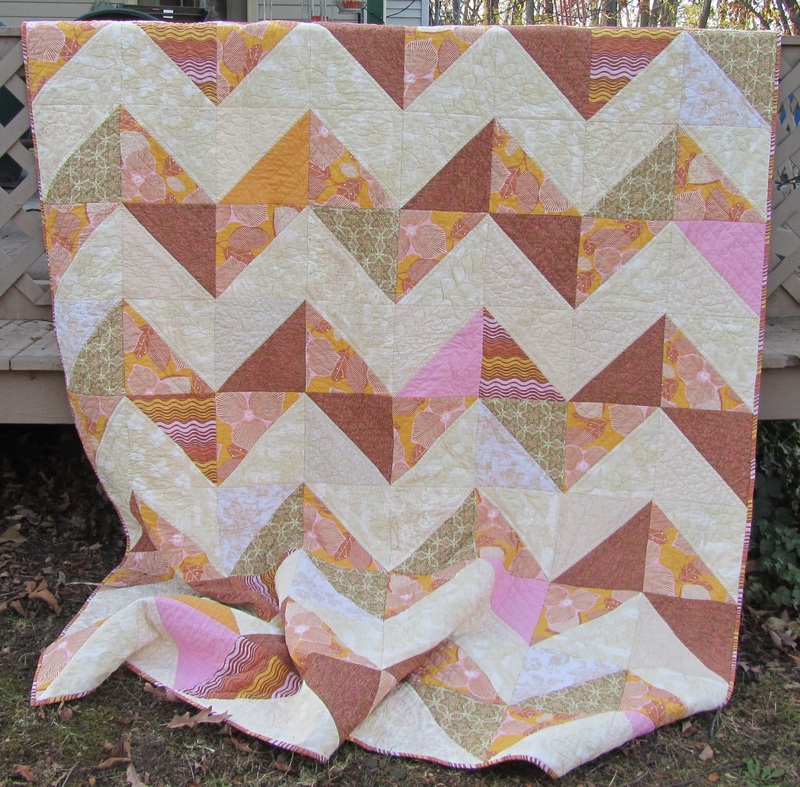 When I went to clean up my scraps from the M. M. Zig Zag quilt, I found that my strings have been breeding again, overflowing their containers, and the new pink and yellow ones wouldn’t even fit. So here are thirty-five 8″ string blocks in that same color scheme. Why mess with success? Planning to sash them with pink and gold Kona solids. 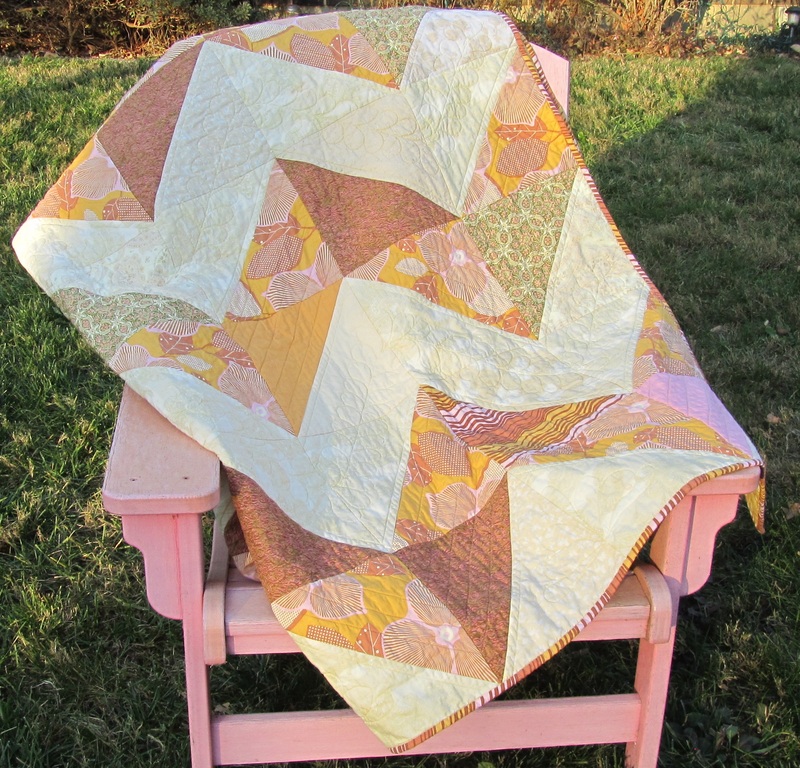 In some ways, string quilts do seem free, don’t they? In approaching it as a business, I’ve come to realize that I did already pay for all of that fabric, even the skinny,stringy edges. 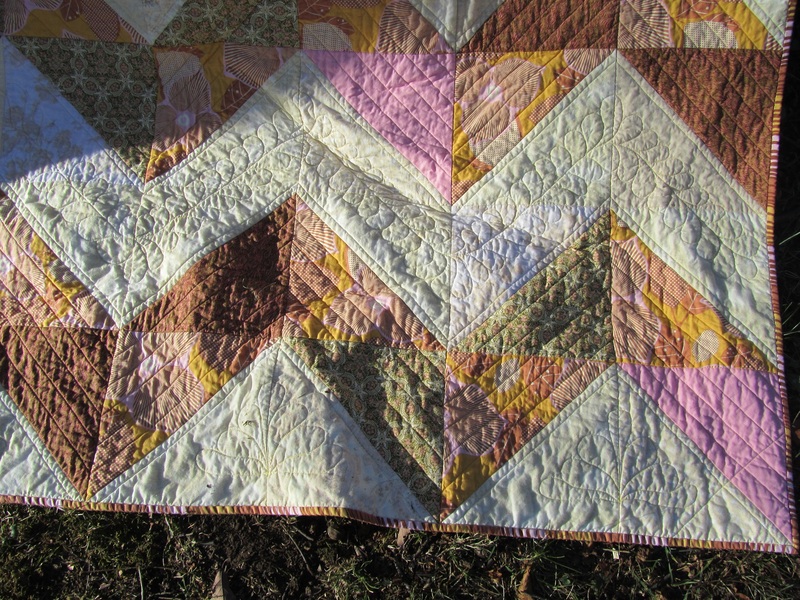 Making a quilt from scraps costs exactly the same, just wringing more value out of the fabric. Still, I like to make them, and I love the variety of fabrics from various projects that come together in string blocks. I used pages from an IRA prospectus (already recycled paper), and after I ripped them off the blocks, we used them to start this evening’ fire. Four uses? Not bad. 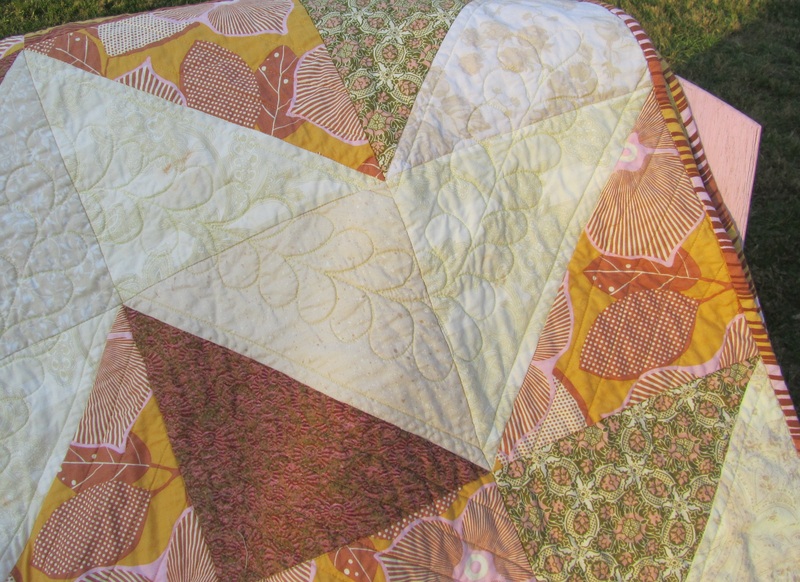 See more Work In Progress at Freshly Pieced. Hope everyone had a good Thanksgiving. Since we traveled most of the week, there was no sewing or fabric used. Of course, one can shop when traveling, but I only bought two yards, so all is well. Net used in 2012: 102.5 yds. On to more sewing this week. 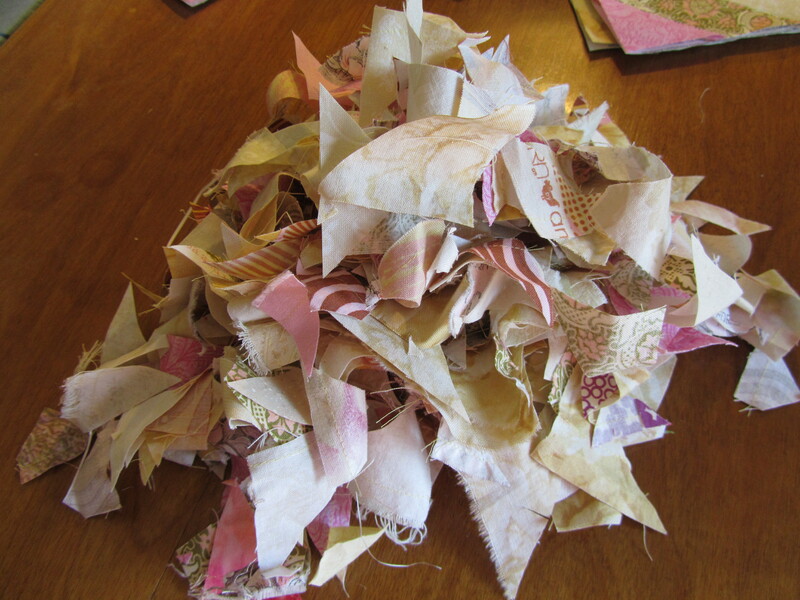 Linking up with Patchwork Times. Take care. I just mailed off this new quilt to Timeless Treasures to be part of the Luanna Rubin’s 5000 Quilt Challenge for Hurricane Sandy relief. 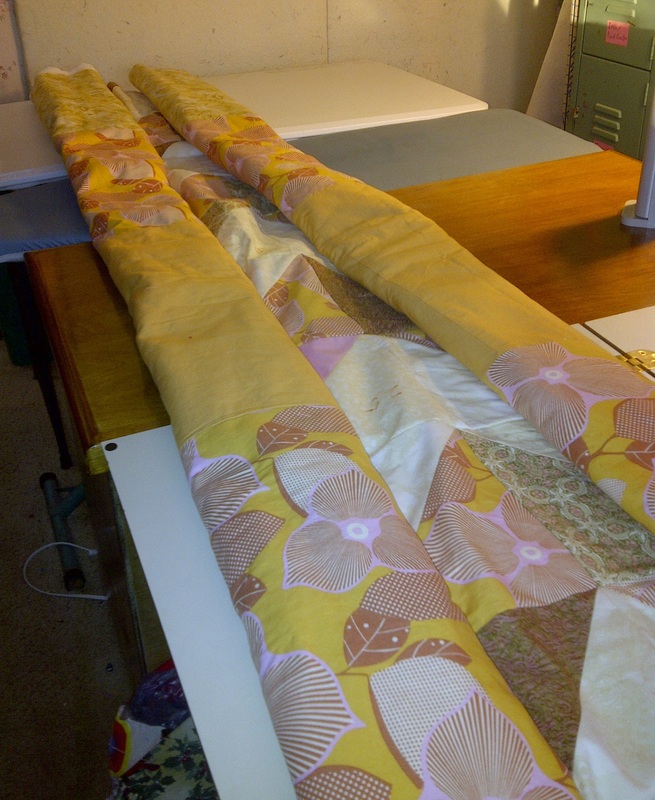 It finished 70″ x 86″, which is about as large as I like to quilt on my home machine. 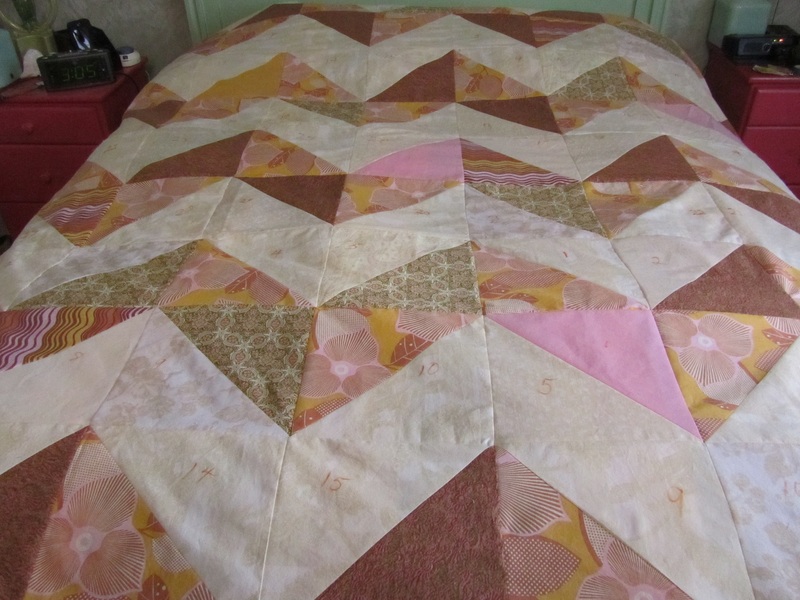 For larger ones, I usually quilt in two pieces, join, then quilt the joined area. This is a very different color palette for me, mainly inspired by spotting the large amount of Amy Butler fabric in my stash and finding I could easily pull enough coordinates to go with it. My donation blocks were bright and cheerful; here I went with soothing. The whole thing has a feeling of butterscotch about it. I hope it warms and soothes someone in need. 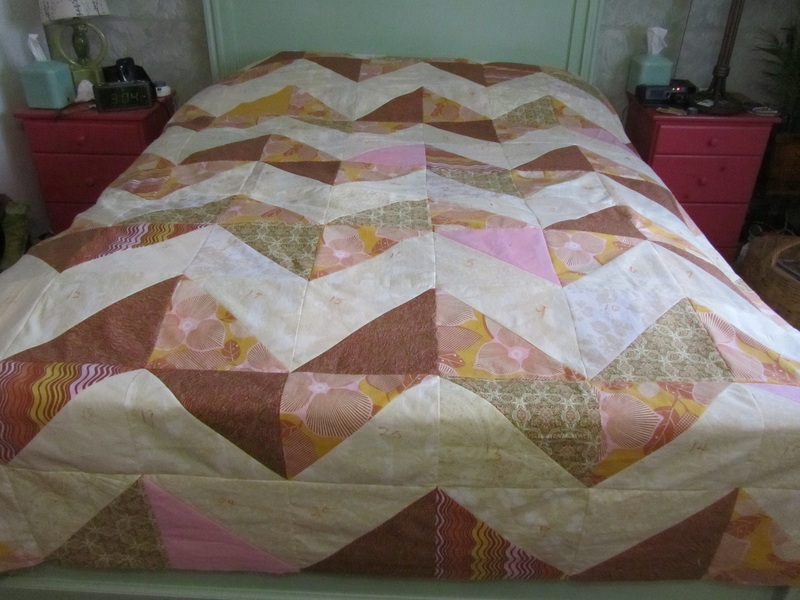 I pieced the top in one day, but the quilting took about 12 hours, which I spread over several days because it was a little hard on my shoulders and back. I started quilting but using the walking foot to quilt a stabilizing grid of lines between all the blocks. For this, I rolled the quilt to fit under the machine. To support this long sausage, I assembled several surfaces. 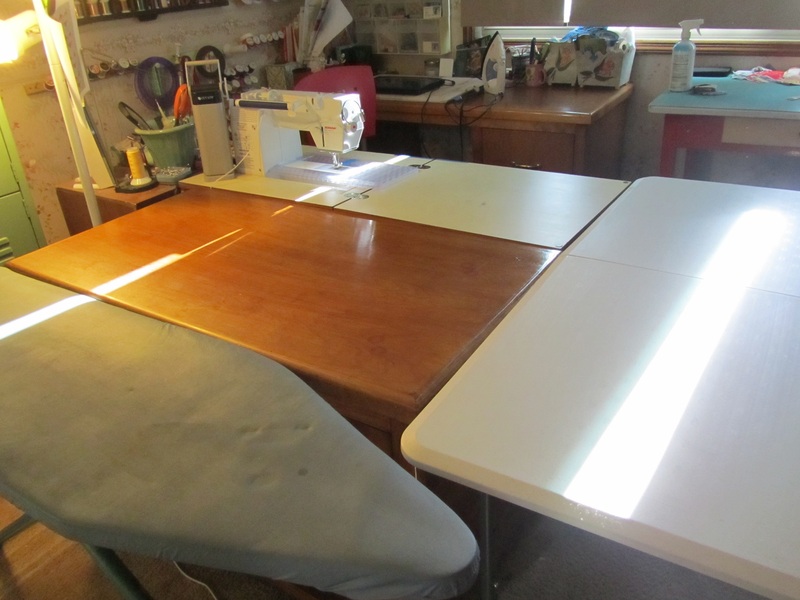 The white is my machine cabinet; the brown is the wooden cabinet that always backs up against the machine cabinet; the silver is my ironing board, lowered to line up; and the white table is a narrow folding table. This table was new this spring for the graduation party, and this is the first time I used it in the sewing studio. It was the perfect size for my cramped quarters. For the straight lines in the chevrons (are “zig zag” and “chevron” completely interchangeable?) I used the walking foot, where I would usually free motion them. However, the large size made it possible to use the walking foot, and I know it made my lines a lot straighter (notice I didn’t have to come on Twitter to beg you to chant about crinkling for me). This was the least fun and most time-consuming part. Shoulder tiring. I found that moving the white table around to the left side of the machine gave me the support I needed for this step. Finally I got to my favorite: free-motion feathers. I know I’m in a little bit of a rut with these, though I am stretching and doing different things with them sometimes. When I get stuck on something like this, I often just go with it until I get them out of my system. Or get good at them. Or sick of them. So far I am getting pretty good at them, though I find that some days I can form feathers and some days I really can’t. More and more I can. And, as Kati R. said, I may just make them forever. So versatile and traditional, but I like the contrast for modern things, too. For the feathers, I used the flatten and smash technique (is that right? Leah Day?). I used the stitch regulator on my machine, but I’m alright without it, too. I just marked the spines (which I quilted before I took off the walking foot) and went for it. I’m pretty happy with them. There’s some glitches and size variation, but I won’t point those out to you. I think it washed up beautifully. I bound it with the coordinating stripe, which is wavy, giving the binding an interesting slanted look in places. It’s all machine bound. This all came from stash, front and back. I enjoyed it, and I hope it comforts someone. Categories: Finishes | Tags: donation, Evening in the Garden, hurricane sandy, midwest modern, modern quilt, Valerie Root, zig zag | Permalink. Yaaah! I did it! I’m in at over 100 yards of net stash reduction, and it’s not even Dec. 31! I suppose the numbers could change between now and the end of the year, but I’m pretty sure I’m good for the 100 yds. What did it this week was today’s finish of a twin size quilt to send to Sandy survivors through Luana Rubin’s 5000 Quilt Challenge. I used large pieces to show off a large scale print, and, in spite of being a pretty quick quilt to get mailed right away, it has received some nice comments. I’ll do a post on it tomorrow. The sun is not currently cooperating for good photos. Next week you won’t hear from me. Our family aways travels to spend Thanksgiving with relatives, so there will be no posts, and definitely no stash reduction, so it’s good that I met my goal now. Net used in 2012: 104.5 yds!!!! Categories: Uncategorized | Tags: Evening in the Garden, fabric, modern quilt, stash reduction, Stash Report, Sunday Stash, Valerie Root, zig zag | Permalink. Here’s the finished top on my bed (no walls large enough). Actually, it looks pretty good in my room… No, this is headed to the east coast. I always feel finished when the top is done, and then remember that I have to piece a giant back. And the batting. Ah, well. Back to it. 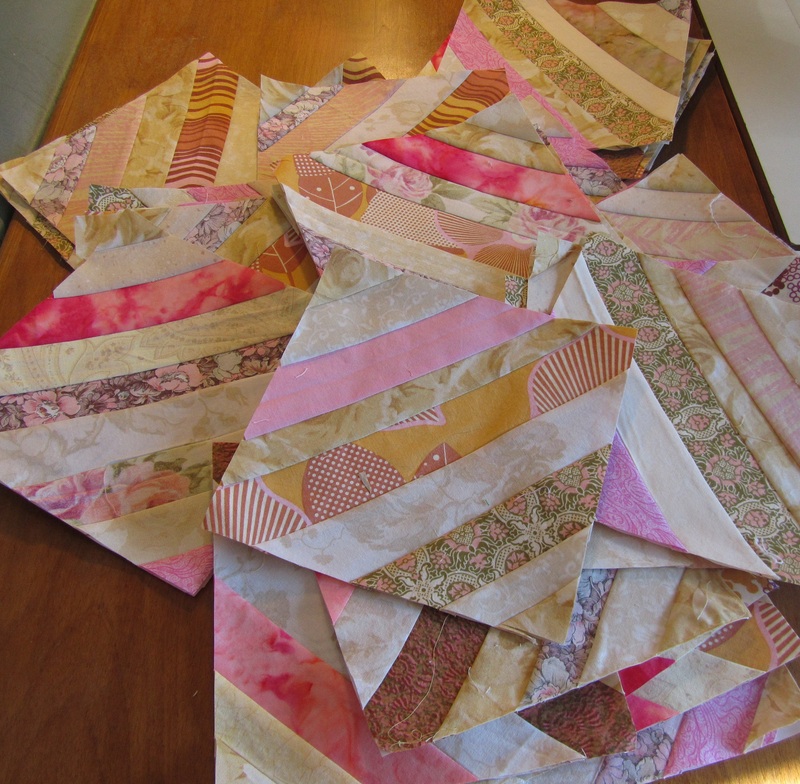 Linking up to Work in Progress Wednesday at Freshly Pieced. 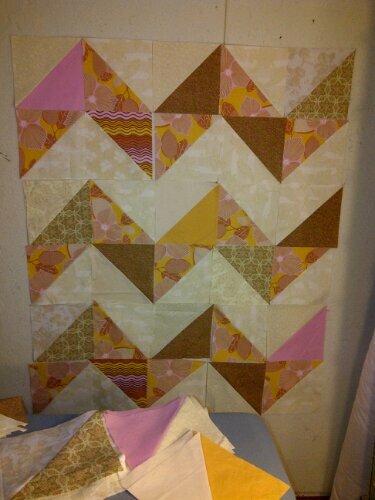 Categories: Uncategorized | Tags: Evening in the Garden, hst, modern quilt, quilt top, Sandy, Valerie Root, zig zag | Permalink. 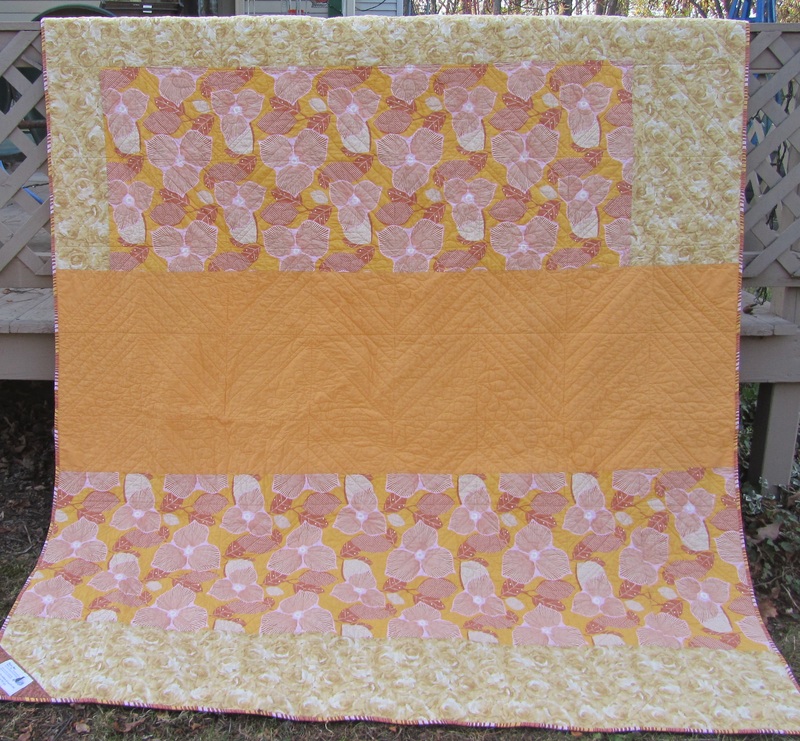 Here is one fourth of a twin quilt that I’m making for Hurricane Sandy relief. Yesterday I made the 99 HST units during the Veterans Day Sew In (#vdsi) on Twitter. The units will finish at 9 inches. I have this quarter sewn together now and hope to get the top finished today. The main pink and yellow prints are Amy Butler’s Midwest Modern. The lighting here could be better. The darkest triangles aren’t really that dark and they blend better. 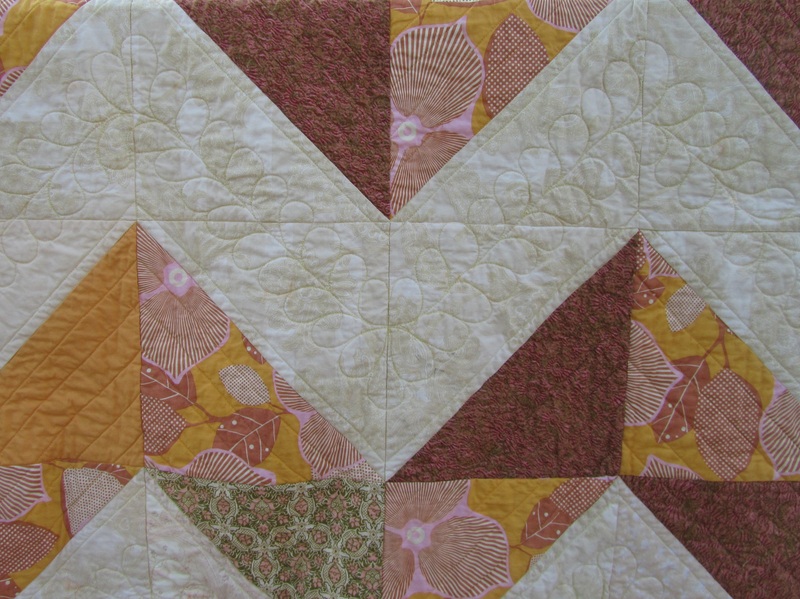 I’m linking up to Design Wall Monday on Patchwork Times. Ooh, used some fabric this week! 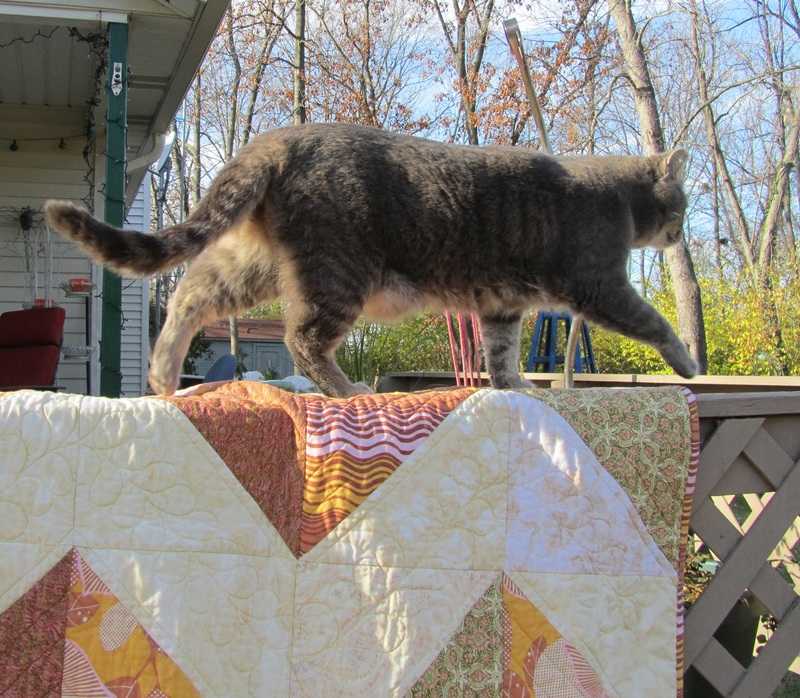 I finished the red and gray zig zag quilt,, 8 1/2 yards, and then finished 12 donation blocks for Sandy survivors, 2 yards, for a total of 10 1/2 yards. This week: +0 yds, -10 1/2 yds. YTD: +114 yards, -203 yds. Net used this year: -89 yds. One hundred yards is in sight! What’s your stash busting goal? Categories: Uncategorized | Tags: sunday stash report | Permalink.